Stephen Gaynor School offers Summer Camp for Early Childhood and Lower School students. 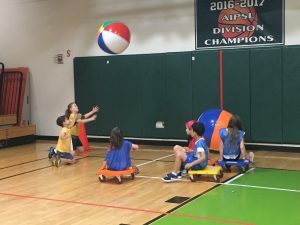 The camps allow students to enjoy a variety of summer activities while maintaining important reading skills in a structured but enjoyable environment. Gaynor’s EC Summer Camp is designed and run by our team of special educators, speech-language pathologists, and occupational therapists. This six-week program focuses on development of self-help, fine and gross motor, social, and cognitive/learning skills. Utilizing our Orton-Gillingham trained faculty, children will maintain the reading skills they learned during the academic year. Math skills taught during the year are maintained and reinforced through small group instruction. Our therapists join teachers to help develop students’ skills through a variety of fun activities, including group games, cooking club, arts and crafts, and trips to the playground. Students participate in field trips to local points of interest. 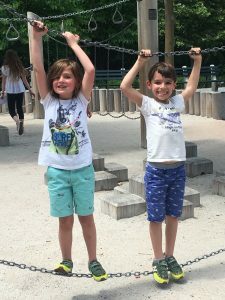 Gaynor students in our Lower School participate in a number of educational and enjoyable activities at Summer Camp to reinforce and further their academic skills, while having fun doing a variety of summer activities. Utilizing our Orton-Gillingham trained faculty, children will maintain and advance the reading skills learned during the academic year. Each morning, campers have small group Orton-Gillingham reading approach, followed by a variety of fun activities including: sports, arts and crafts, science exploration, music and drama, cooking, and water play. Students participate in field trips to local points of interest. Current parents can find out specific information and register for summer camp by signing in to the Parent Portal and visiting the link for Summer Camp Registration.